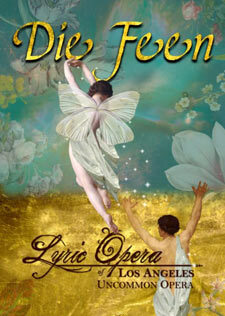 Lyric Opera of Los Angeles (LOLA), a non-profit performing arts organization, will present the rare and first-completed opera by Wagner entitled “Die Feen” (The Fairies) during five performances starting on June 11, 2010. The performances will take place at the Pasadena Playhouse as part of the Ring Festival LA’s scheduled events. The Ring Festival features the participation of more than 50 arts institutions around Los Angeles that will produce exhibitions, concerts, and educational programming related to Wagner and his music. Founded in 2002, Lyric Opera of Los Angeles (LOLA) brings lesser-known operatic works back to the stage. LOLA is known for its West Coast and staged premieres of works such as “Der Vampyr” by Heinrich Marschner, the chamber operetta “Cendrillon” by Pauline Viardot, “Goyescas” by Enrique Granados, “Abu Hassan” by C.M. von Weber, “Rita” by Donizetti, “Manon Lescaut” by Daniel Francois Esprit Auber, and “Un Giorno di Regno” by Giuseppe Verdi. Their 2010/2011 season will bring about the U.S. Premiere (possibly a World premiere, as there have not been any performances in over 100 years) of “Le Philtre” by D.F.E. Auber, and the other “La Boheme” by Leoncavallo. In 2009, LOLA was selected as an official Partner of the Los Angeles Opera for the 2010 Ring Festival and will be presenting Wagner’s first completed opera “Die Feen” (The Fairies) in June 2010. This work has never been staged in the United States.